We meet the two main characters right out of the gate, one being ex-military Ash DeHaan and Lainey Simpson who will be starting a new job as she recently graduated from college. Lainey has no living family members left. Her grandmother recently passed away, leaving her estate to Lainey. Ash has served in the armed forces exceptionally well, being known as a brilliant strategist. Ash and two other friends of his have been asked to be special operatives off the books for the CIA. No one will know about their missions, including any family members. During a jog, Lainey is surprised to see Ash as they both seek shelter from a sudden downpour while in the mountains. From there, readers see what begins to quickly develop between Ash and Lainey as well as some of the darker side to Ash’s personality and possessiveness. The story is a little more suggestive in some ways than I was comfortable with, but I wanted to see where the author was taking the story so I continued reading. I am glad I stuck it out as her sequels really are outstanding! 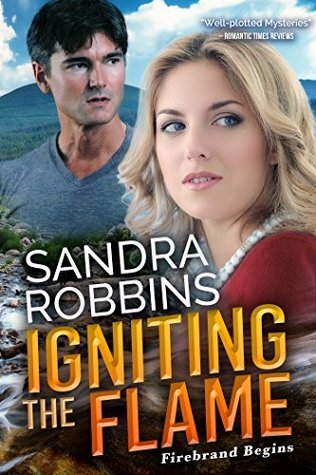 In the first book titled, Targeted, Sandra develops a very heart-touching story that focuses of Ash and Lainey. When readers come to the second novel, they will meet familiar characters introduced in book one. The main focus of Hunted is Colt and his wife Sloan. In the final book titled, Betrayed, we get to see if anything develops between Reese and the woman who has pined for him, Deputy Casey Morgan. The whole series is mainly based in St. Claire, North Carolina. Some of the scenery described in the Firebrand series places pictures in my mind that make me desire to visit the mountains in that particular state. Enjoy the Firebrand series; it’s fantastic!